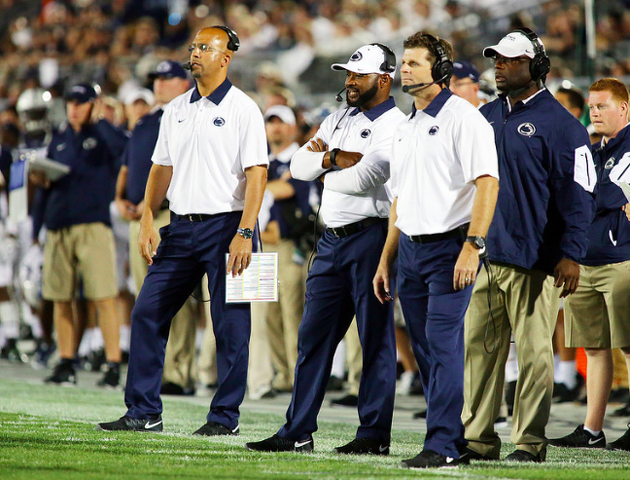 Earlier this season, as it became apparent that Penn State's offense was perhaps never going to meet expectations, James Franklin was asked about his role with that unit. More importantly, Franklin was asked if he would be more involved on the offensive side of the ball -- the implication being that he would take over the reins from offensive coordinator John Donovan, if not full time at least as Franklin saw fit during the course of the game. Franklin's answer at the time was that he would be more involved in the offense, but he did little to provide insight into what exactly that meant. Fans and most of the media took that to mean Franklin would be calling plays and being more hands-on with the in-game decisions. Fast forward a few weeks later and that doesn't appear to be the case, a point that John Donovan himself confirmed on a conference call last week, stating in short that Franklin is just as involved with the offense as he's always been, but also offering little insight into what that means. So on Tuesday, Franklin cleared the air, or at least attempted to, clarifying what exactly his role is with the offense. "I think John's point is a great point," Franklin said. "There's not an aspect of this program where I'm just sitting back and letting it happen. I'm very involved with the defense. I literally just left one of their meetings. I'm very involved with special teams. We met this morning at 7 a.m. I'm very involved with the offense. Since the Temple game, did I get more involved on game day? Yes. Have I done that? Yes." "The challenging part -- and I know some people do that differently, but when you try to be the CEO of the entire program -- and there's academic responsibilities, there's the offense, defense, special teams, there's all the other things that we're responsible for. I've never been around anyone that has been the head coach and also one of the coordinators when you're constantly being pulled out for something," Franklin said. "A player has an issue, and now I'm pulled out, and now the whole staff is sitting there waiting for you to come back. I've never been around anything like that." "So John's point was the guy cannot be any more involved in all aspects of our program, which is an accurate statement. But I have been more involved on game days of saying run now, pass now, move the pocket. These are some things we need to do," he added. "In the past, I've made some suggestions, and I've made some more stronger suggestions here recently. I wouldn't say play calling. I would say more about what we're doing. We need to run the ball right now. We need to throw the ball right now. We need to move the pocket, those types of things." And this quite frankly makes sense. The chaos that would likely come from bouncing between two play callers during a game not only negates the need for an offensive coordinator in the first place, but in its own way undermines the legitimacy of Donovan's role. Franklin's primary objective is to shape the overall philosophy of a drive or a game plan that gives Donovan a direction to work in, a framework to call a game from within. Ultimately, the exact involvement probably doesn't matter much. If Franklin calling plays is the difference between winning and losing, successful offense and struggles, then the change would have already been made. Both he and Donovan calling plays just muddies the waters and gives fans variations on the same struggles the program is facing. What happens once the season ends? That's a question only time will answer. 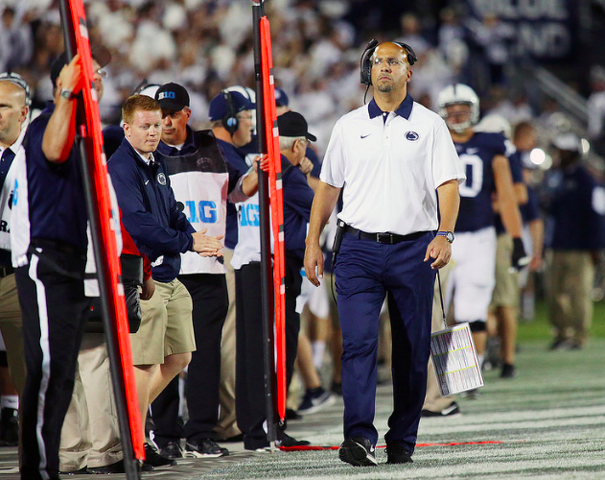 With only minutes remaining in Penn State's loss to Ohio State this past weekend, the Nittany Lions trotted out a hobbled Christian Hackenberg and a healthy but recovering Saquon Barkley on to the field.